One thing most American boys remember is the first car on which they learned to drive. I my case, I also recall the first US Army vehicle I ever drove: an M35A1 truck belonging to my unit in Vietnam. That truck, coded 509 RR GP - 335 25 (for 509th Radio Research Group, 335th Radio Research Company vehicle number 25) was a normal truck less than four years old and already missing parts. It was our “trick truck” or way to work, and was affectionately (or otherwise) known as “This Piece of @#$%”. We had two others, 26 and 27, which of course became “That Piece of @#$%” and “The Other Piece of @#$%”. But as noted we were missing bits; we had but one set of troop seats, one canvas, and three top bows for it, so it was a rather sad looking machine on the road. Mechanically it was not bad – after I had been “in country” a while I found that the governor had been removed and I could get this one up to 70 mph or more (the “Book” said it was governed at 56). I did get injured in a wreck with “That Piece of @#$%” 38 years ago when it slammed head-on into another M35, but even so did have a fondness for what became my “Ten Wheel Sports Car” while there. Later as a platoon sergeant I had two others – 337th ASA Company A-221, better known as “Schmuck the Wonder Truck” and one with 522 MI BN at Fort Hood. To this day I still like the “Deuce” as it was popularly known to the troops. 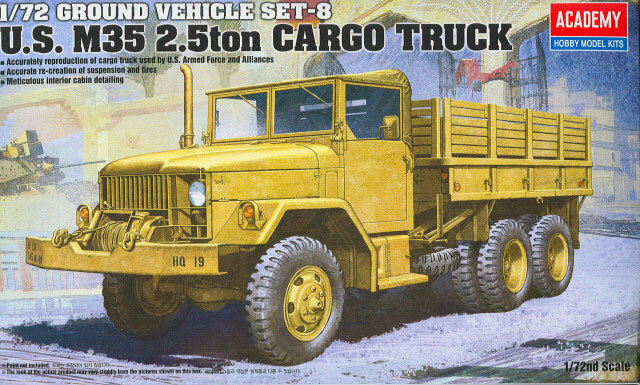 Models of the Reo designed 2 ½ ton 6 x 6 trucks have been around since the late 1950s when Monogram released their kit of the M34 as the “Eager Beaver”. This was the single wheel version that never gained either the numbers or popularity of the M35 with its rear dual wheels. Revell released an M35 a few years later but it was in 1/40 scale and had a lot of shape errors. ROCO did one in its first generation of models in 1/87 in the early 1960s but it too was not right, and it took until the 1980s to release a redone model that looked the part. In the late 1990s AFV Club released a series of M35A2 trucks in 1/35 which were excellent. But with this kit Academy is the first one to release it in 1/72 scale in styrene. First off, there are four different variants of the M35. The M35 is the first model which was powered by a gasoline engine (“gasser” to the Army), generally had “low” headlights (on non-winch equipped variants; “high” lights were used on ones with a winch, but any vehicle could have its lights “converted” by removing the light panels and reversing them), small turn signals and tail lights, and a low mounted exhaust that exited between the right side rear duals. The M35A1 replaced the gasoline engine with a 427 cubic inch “Multifuel” engine which was better but still weaker than a straight diesel; later production runs switched to a vertical exhaust stack on the right side in front of the passenger’s door. The M35A2 was a pure diesel and used the stack, but soon after they entered production the vehicles received “highway” turn signals and tail lights which were much larger and also a screen which went across the center of the grille. The M35A3 was a complete redo of the vehicle with a new engine, automatic transmission, and a fiberglass one-piece hood and fender unit that tipped forward with the headlights now mounted where the turn signals went. Academy’s model is either an M35A1 or early model M35A2 with “high” lights and a winch; the reason is that it only comes with the “small” tactical type turn signals and tail lights. It also has the earlier model side mirrors; later model trucks were fitted with big “California” mirrors and much more complex bracing. The entire cab unit of cab, hood and grille assembly is molded in one piece via “slide molding” and is nicely done, but the grille is a bit shallow in depth. The headlights are molded in place, but should be easy to drill out and replace with MV Lenses (the lenses should be the ones closest to 0.104" in diameter). The frame is built up from two rails and “innards” and includes the front tie rods, transfer case, transmission, winch drive and winch, and springs and axles. The vehicle comes as “winch only” but with some care a few mm can be cut from the frame rails and the bumper mounted notch side down to make a non-winch equipped truck. No levers are provided for the cab interior, which is a bit odd as they are quite obvious and large. The M35 with winch has three levers in the center (shifter, transfer case control, and high range/low range selector) and one on the side of the driver’s seat to engage the winch drive. The windscreen comes with wipers but as it now the unfortunate norm with Academy no clear styrene insert for the windshield, nor is there one for the plastic one in the cab roof. There are also no floors on either the battery box or the tool box (the boxes with steps on the sides of the cab; battery box on right, tool box on left). The cargo body is a separate sprue as noted, and is good as far as it goes. No braces are provided for the troop seats (one under each crossbar and butting up against the angle of the floor and body) nor is there any attempt at details for the cargo body tarpaulin (“roof”) tie-downs on the sides of the body, nor reflectors. You may feel that I don’t like this model; not true. It is not bad and the moldings provided are very nice, but when one is intimately familiar with the truck (as a newbie I was “fished” into rotating the tires on one of the trucks in Vietnam, which makes you VERY familiar with it as well as when you are “signed” for the sucker!) you notice what it does not have. The only major external item actually missing is the front machine gun ring brace, which appears as a tube in front of the right front side of the passenger’s door that starts at the top of the door and ends at the bottom edge. This was present on EVERY Deuce I ever saw and is the sole major goof that Academy made on this kit. The box art is great for detailing and other than the fact it has the “highway” turn signals and you can’t see the machine gun brace mount is good for detailing the model. Finishing directions and pretty complete decal markings are provided for two vehicles: an Operation Iraqi Freedom truck coded for A Company, 345th MI Battalion, 81st Support Command (I think – not sure) in modern US Army Desert Sand and one from Vietnam in Olive Drab coded for C Troop, 1-11 ACR. The latter has a hood serial of “SN19998" which I think is bogus, as most vehicles in that time frame were using number - letter - four number codes, but that’s a minor quibble. Overall, this is a very handy and useful model which fits into any time or location from 1954 to the present. With a few “tweaks” in the way of details and some different markings it can be a real showpiece. Thanks to Ed Sexton of MRC for the review sample.